She is Amy (Willard) Hazelton or Hazeltine, b. 25 Dec 1730, dau. of Joseph and Elizabeth (Tarbell) Willard and widow of Samuel Hazeltine who had d. 23 Jun 1754. 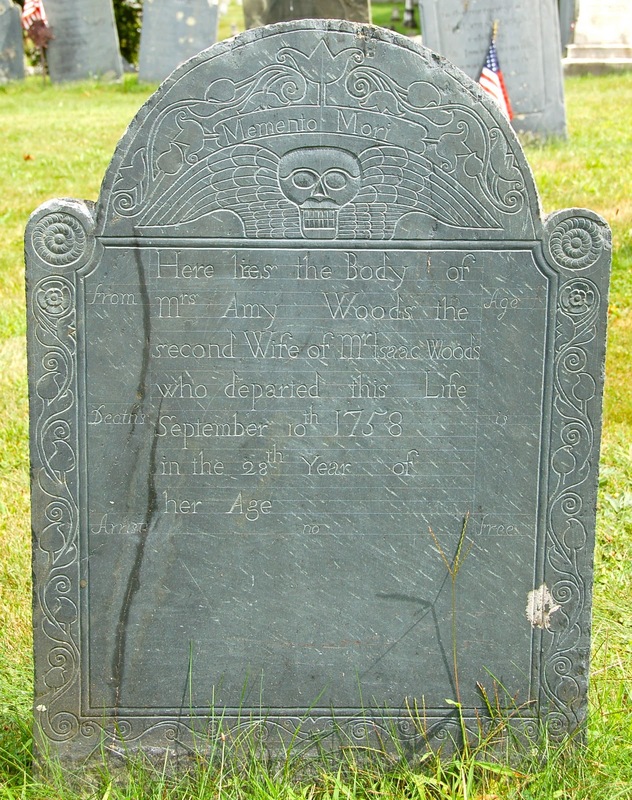 Not many Amy's in Massachusetts in the 1750s. I wonder where Mr. & Mrs. Willard got the name. Interesting — I guess it never crossed my mind that Amy was a rare name here because it shows up with some frequency in Rhode Island. Having started my gravestone studies in Providence, my view of "normal" is probably skewed a bit toward the oddities of Little Rhody (admittedly, it is and was a strange place). There are several names that are all over Providence/Newport, but rare in Boston — my favorite is Freelove. Pete has a pair of great-great-great aunts named Tryphena and Tryphosa. I told him that if we ever have twins, they're near the top of the list, next to Diligence and Vigilance.